Pier 9 at Penn's Landing is 93-year-old, 55,000-square-foot warehouse that has stood empty for a half century. The Delaware River Waterfront Corporation is completing funding to convert the property into a mixed use art space with studios, a gallery and a beer garden. Spruce Street Harbor Park came to Penn’s Landing in 2014, seducing visitors in droves with its food trucks, twinkly lights, and coveted hammocks. Since then, the park has expanded from season to season, infusing new vendors, more beer gardens, a roller rink, and, new this year, the Midway, which incorporates boardwalk-style rides and games. Along with its seasonal foil, Winterfest, the pop-ups have brought new interest and new life to the waterfront in recent years. Even still, the pop-ups are merely that – temporary, leaving a vacancy for a year-round, sustainable point of attraction along Penn’s Landing. FringeArt’s La Peg has been a steady fixture by Race Street Pier for nearly three years thanks to a reinvented menu and expansive multi-use space that works as well for weddings as it does for performing arts productions. 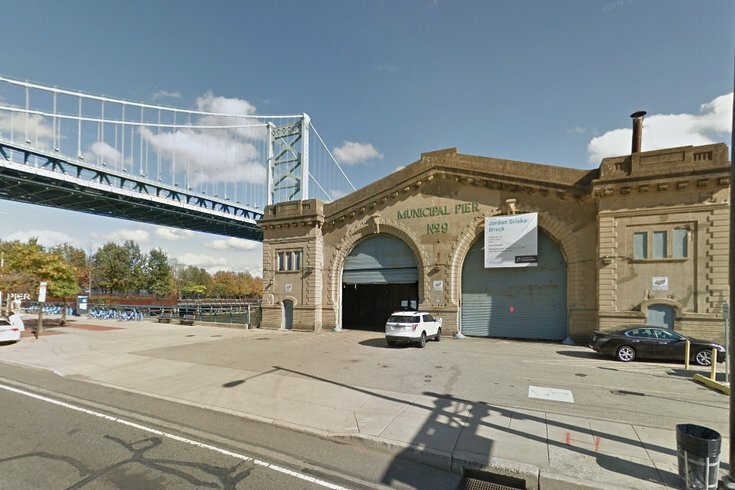 Perhaps taking a cue from La Peg’s success on Penn’s Landing, the Delaware River Waterfront Corporation is completing funding to create a new year-round, mixed-use art space on Municipal Pier 9. What exactly is Pier 9? Right now, not much of anything. The 55,000-square-foot warehouse, adorned with double floor-to-ceiling garage doors and sealed windows, has stood empty for more than 50 years and clocks in at 93 years old. Last fall the DRWC released a report about the potential for Pier 9, describing the possibilities for using it as a “collective space” and outlining its success in hosting a couple art exhibits and offering renderings of how the space could look after renovations. Part of the picture includes a clear view of the sky, which would call for the complete removal of some or part of the warehouse’s roof. Joseph A. Forkin, vice president of the DRWC, told Philly.com that the agency has raised almost all the funds necessary to transform the structure, which the agency envisions will include glass-wall artist studios, a gallery, and a beer garden. Pier 9 is just one of several development announcements regarding the waterfront in recent weeks. A monumental $225 million was raised to completely reinvent Penn’s Landing and make the waterfront accessible from Center City, including new parks, new space for vendors, and new housing. These developments, as well as plans for the Cherry Street Pier, could create a more walkable area of the city, which is now isolated by freeways and a scarcity of sidewalks. Other proposed projects to the waterfront include townhouses near Sugarhouse Casino, neighboring Penn Treaty Park, and high-rises by Spring Garden Street.